Eloise Hill is a nurse, author, and three “C” psychic—clairaudient, clairsentient, clairvoyant—with more than 40 years experience doing intuitive readings and healings. She has been aware of her psychic abilities since the age of three and studied with the late psychic medium, Dr. Karen Lundegaard. Her areas of expertise include reading the Tarot and the Elder Futhark Runes, working as a medical intuitive and with passed over loved ones, and doing chakra rebalancing/healing. 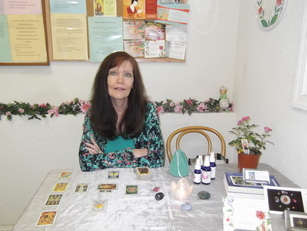 She has also taught the Thoth Tarot and is the author of the Eilleen McGrath Tarot Mystery Series. For a 30 min reading $65, 60 min reading $130. To pay for an appointment, you need to make 2 transactions. 80% to the consultant and 20% to Angel Light.